Hello readers, welcome to this weeks Read With Me. I feel I've got my reading mojo back this week, with hubby on night shift I've had the evenings to myself so I have had time to curl up with a good book. I was starting to think I would have time to add my own personal book reviews but like buses I've suddenly had 6 book reviewing opportunities all coming up at the same time. I'm now the best mum ever because I got the latest Jacqueline Wilson book through to review so keep and eye for my thoughts on that as well as an added bonus of my eldests review within that post. So what have I been reading recently? One To Hold by Tia Louise, part of a series of books, I actually decided to read this as it was free on Kindle but I was pleasantly surprised and plan to purchase the other books. My favourite from this week was Nine Minutes by Beth Flynn, not your typical romance and one that has you questioning things, you can read my review on good reads. And my favourite post which was linked up last week was from Tea Lady Mumbles. She reviewed Disclaimer by Renee Knight, it was a refreshingly honest review and made me want to read the book to see if I'd draw the same conclusions. On to the link up. New to Read With Me? Take a look here at what it is all about. Regular? Get linking, commenting and hopefully displaying my badge. Thanks for everything and have a great week. Happy Reading to all. Thanking you for running this book get together which I am really enjoying and everyone who takes the time to visit and leave comments too. Hi Chantelle! 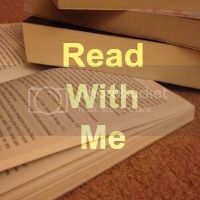 Thank you for hosting another week of 'Read With Me'! Shared it! Have a great week! Thank you, I have added a post about the little free library movement. Has it reached the UK?